On NetGalley Insights, we highlight the successes of NetGalley publishers and authors, and share some of their strategies. 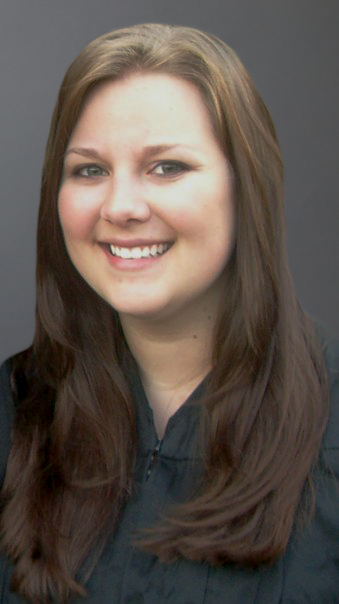 Today, we’re talking with Jessica Brock, Senior Publicist & Digital Media Strategist at Berkley about The Kiss Quotient. Published in May 2018, this modern romance featuring a heroine with Aspergers has been both well-reviewed and enthusiastically embraced by readers. And, it even has a movie deal! One place that The Kiss Quotient really resonated was on social media. BookTubers posted video reviews and Bookstagrammers placed it in aesthetically pleasing shots. Jessica knew that putting The Kiss Quotient into the hands of social media influencers was going to be an important part of building its buzz. And, she even used the campaign as an opportunity to build her network of social media influencers! Learn more about her strategy in the interview below. Tell us about your strategy for getting influencers excited about The Kiss Quotient. Immediately upon finishing The Kiss Quotient I knew it was going to be something special. The first step for me was determining how to shout “READ THIS BOOK!” to the widest audience possible. This story isn’t just for traditional romance readers and I wanted to make sure people knew that. The campaign began with a cover reveal and excerpt on Bustle, hitting a key, younger female demographic. The cover popped, Helen’s personal stake in the story intrigued readers, and the excitement began. After that, my main goal was growing steady interest in the book among bloggers, Bookstagrammers, and bookish influencers. Providing early galleys and e-galleys was a big part of that, as well as continual coverage on Berkley Romance’s social media platforms. This is a perfect example of “Oh, I’ve seen that!” publicity awareness. 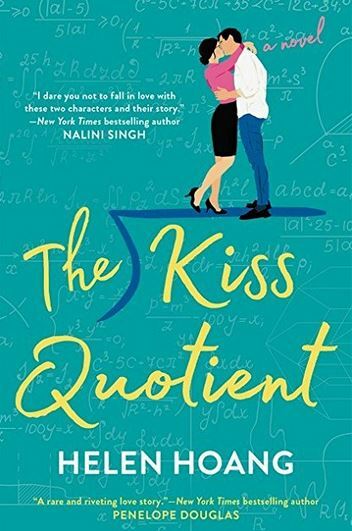 In my outreach to influencers, I talked about The Kiss Quotient like I would with a friend, with delighted squeals, OMG’s, and BAE’s included. I also specifically asked that they “help me tell the world about this book” via Twitter, Instagram, Goodreads, and Facebook. I didn’t have a platform preference because I wanted to reach as many readers as possible. I do think that Bookstagram played a major part though as the cover is quite ‘grammable. On a visually driven platform, The Kiss Quotient stands out beautifully. How do you build relationships with influencers as a publisher? One of my main responsibilities at Berkley is communicating and cultivating relationships with media contacts and influencers, in particular those who focus on romance. Romance bloggers are the backbone of the online romancelandia community and I absolutely love working with them. I send out two curated monthly newsletters to romance-focused bloggers and media contacts, chat with people on Twitter and Facebook, and generally try to keep up with what folks are reading, because romance bloggers are ravenous readers. We do our best to get them galleys as early as possible with the hope they will read and love our books and ultimately share reviews around the release dates. How did you let influencers know about The Kiss Quotient and how did you give them access to read it? What was your balance between proactive outreach and responding to requests? I sent pre-approved NetGalley widgets to a large list of media contacts and influencers. [Widget invites accounted for 26% of all members with access on NetGalley, so this strategy was highly effective!]. I also sent out a number of print galleys in fun packaging (I love color coordinating!) that I hoped would encourage them to share images immediately on their social platforms, mainly Instagram as it is so visual. I knew the “Look how pretty” appreciation at the beginning would morph into the “Omg this book is amazing” attention as soon as they began reading and that they would share those thoughts on their social media as well. Custom eblasts sent to NetGalley and BookishFirst members drew requests on NetGalley and previews on BookishFirst. I also dedicated a lot of time to responding to requests for the book. There were numerous BookTubers and reviewers who requested The Kiss Quotient that I had never worked with before. Granting them access to the book and getting to know their channels and sites has been a great way to start successful working relationships with many of them. And I would be remiss if I didn’t mention the benefit of some light internet stalking! 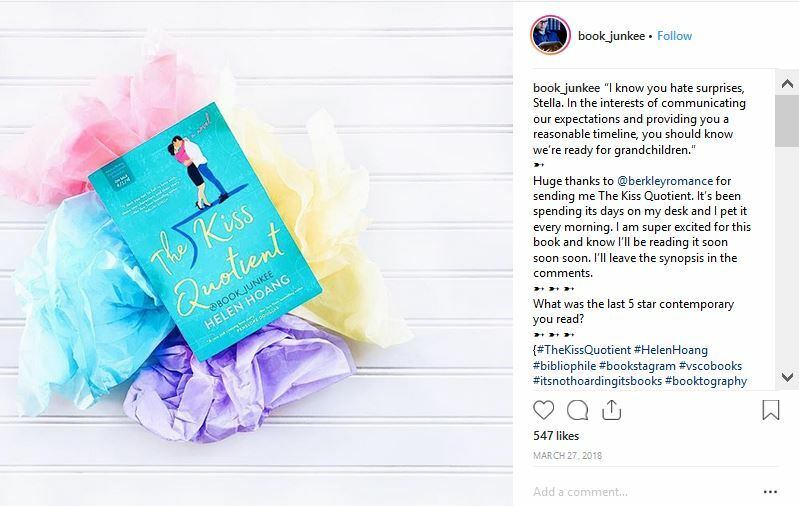 If someone posted about The Kiss Quotient on Instagram, I would check the comments to see if they were from other influencers that I could also approach for review or feature coverage and I did the same with Goodreads. Twitter searches also proved very useful as the title of this book is pretty unique so I could easily see who was talking about it without having to filter through a lot of non-book related posts. Aside from working with social media influencers, what other strategies did you employ for The Kiss Quotient? I secured a lot of mainstream media attention, including The New York Times, Entertainment Weekly, and Buzzfeed, which piqued other outlets’ interest in the book and Helen’s personal story. 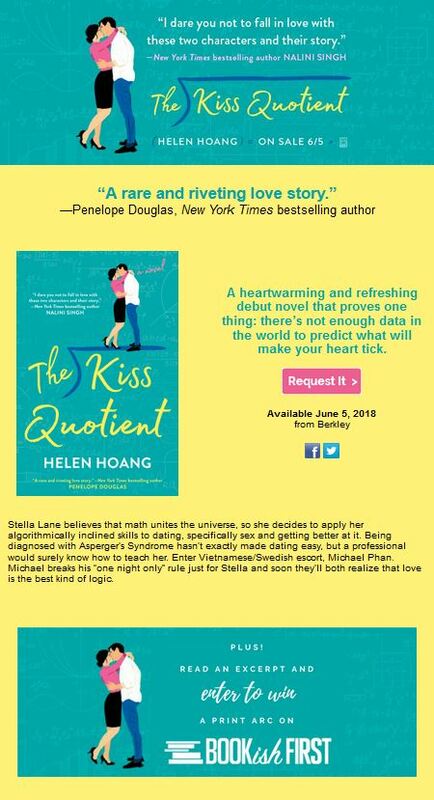 I highlighted The Kiss Quotient’s strengths, joined the excited conversations with early reviewers, and reached out to other authors whom I thought would love Helen’s book as much as I did. Support from fellow authors can make a significant difference in reader awareness and publicity opportunities. 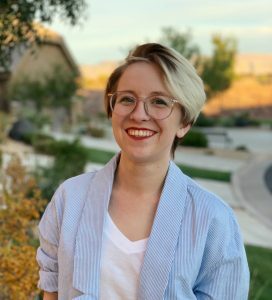 Jessica is a Senior Publicist and Digital Media Strategist at Berkley who manages the romance social media accounts and works with authors like Helen Hoang, Jasmine Guillory, Alexa Martin, Samantha Young, Uzma Jalaluddin, and more. A self-proclaimed Slytherpuffenclaw, she loves to read YA as well as romance and dark-and-twisty thrillers. Check out the rest of our case studies here! BookTubers are enthusiastic readers who share their enthusiasm with their audience, which often range in the tens of thousands or more. They recommend new titles, post reviews, unpack boxes of books, show off their bookshelves, participate in interactive reading challenges, and more. In our Ask a BookTuber series, we hear directly from these influencers about their platform of choice, their audiences, and the kinds of books they are most interested in reading for their channel. Plus, they tell us which BookTubers they are watching! Cece is “23, super gay, and a lover of all things bookish.” She reviews all genres of books, but heavily promotes any and all LGBTQIA+ fiction. 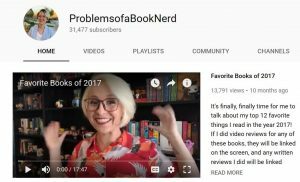 Her channel features reviews, recommendations, bookish songs, unboxings, fandom discussions, and the occasional vlog. Here’s a video where she describes herself through books that she loves and identifies with. 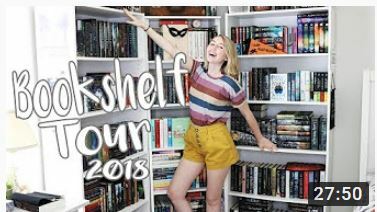 You can watch a video of her most anticipated LGBTQIA+ books of 2018, as well as a video full of LGBTQIA+ reading recommendations. What do you love the most about your audience? I love their support. No matter what I create, there is always a support base there. They rally me on when I’m unable to make as much content, when I make content that is unusual for my channel, and honestly whenever I post. [They] mainly support me through comments on videos, but their support isn’t limited to that. I have a lot of viewers who reach out through Instagram, Twitter, and Tumblr to send me messages. Especially if I have posted on Twitter that a video has gone up recently, or that I might be delayed in posting, I get responses and direct messages that let me know people appreciate what I do. Sometimes I get video suggestions, or messages from people letting me know I should put my mental health first. But the comments on videos are where the bulk of information from my [YouTube] subscribers comes from. There is a real loyalty that I never expected from the viewers of my channel, which is why I’m always motivated to come up with new ideas and read as often as I can. They support me, which makes me eager to create content for them in return. The majority of my viewers are between 18-35, despite the fact that I read and review mostly YA. They are eager to learn more about unusual and less publicized books, and especially about diverse releases. They want to be as knowledgeable as possible about which books contain what kind of representation. I can’t count the number of times that I have comments from people about how if they had known a main character was a person of color/queer/dealt with mental illness, they would have read a book so much sooner. Knowing these details is important for my audience; [it] helps to sell them on a book. What do you think is unique about video as a medium and about YouTube as a platform for book lovers? I think there is a certain energy when you can actually see a person who is excited or let down or angry about a book. I love reading written reviews, but I really appreciate the spontaneity and extra visual layer of YouTube as a reviewing platform. I think it showcases books in a new way, and as a person who has always loved to read, I adore the different ways readers adapt to sharing their passion. Describe your tone as a BookTuber: What is it about that tone that resonates with your audience? I attempt to be positive and uplifting in every video. I think that upbeat aspect of my content resonates with people because they feed off the energy that I put in. I am excited and I don’t hide it, and people appreciate that realness from the YouTubers they watch. [But also], my tone is determined based on the content I am producing. I think when it comes to books I keep a pretty standard, upbeat tone unless I am doing reviews for standalone books. There are book reviews I have done that are about more serious topics (I did a video reviewing The Hate U Give by Angie Thomas when it was originally released, and there is also my stand alone review of We Are Okay by Nina LaCour) and I think I am a bit more serious in those videos in order to better represent the tone of the [books themselves]. When I’m doing videos where I talk about books I didn’t like, or [sharing] unpopular opinions about books, I still try to be upbeat but it becomes a bit more sarcastic and teasing than in other videos…I never want those videos to feel like downers. [Also,] There are times when I am talking more specifically about my life or specific mental state (as in a recent video I did about my hair and how it affects how I see my sexuality). I also think that genuine positivity is something that I have needed more and more from the content I have consumed in recent years, so I always want to be that positive voice that others might need as well. Plus, it helps that I am frequently talking to queer viewers about queer stories. So often queerness is turned into tragedy in popular media, so I view my place as a happy lesbian as being important for others to see– it is important for queer viewers to find stories about happy queer people. Why is video the right platform for you? Video captures my feelings better than any other medium. I have a degree in English, so there is always this assumption that I must be an effective writer, but I can never quite get across my feelings in writing as well as I do in a more visual medium. When I was a kid, I was a visual comedian. I am a visual learner. I just think that conveying emotion, for me, is largely linked to my physicality, which is why YouTube works more for me than any other medium. How do you pick books and authors to feature on your channel? I use a variety of sources, for sure. My anticipated releases almost always come from Goodreads lists and Barnes & Noble’s upcoming releases posts. Other books come largely from recommendations by other BookTubers, but also through announcements on Publishers Weekly and Twitter. My favorite places on Twitter for book recommendations are @LGBTQReads, @bookvvitch, @SaundraMitchell, @romweasleys, @sapphicsolace, @yabookscentral, @prideathon, @bbliophile, and through following lots of big name and indie publishers online. I keep up with release announcements as they come through publishers and authors. When I pick which books I really want to talk about, though, it is mostly reliant on what I loved most or am most excited to read, while also being influenced by what I think my audience will want to know about. If there is a book I’m not particularly excited about, but it features some form of representation that is harder to find, I will work in ways to discuss that book because I want my viewers to have the easiest access possible to books they may be interested in. What strategies do you use on NetGalley to find books to request? I rely very heavily on searching through specific categories. My most searched category is, of course, the LGBTQIA section (pictured left), since that is what my channel’s primary focus is. But often books are not cross-referenced [with other] categories, so there are queer books listed in other places that I don’t find in that LGBTQIA category. * That’s usually when I search through the Teens & YA and, sometimes, the Literary Fiction sections. I will say that, often, digging through the literary fiction books leads me to discovering books I want to read that I had never heard of before. Requesting those books is something I do more sparingly, since I know less about them, but it has led to me finding a variety of books I never would have read otherwise. 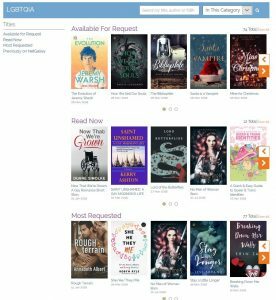 Beyond that, I sometimes find and request books through NetGalley after an author or another blogger lets me know that a book is available on the site. I think there is definitely a trend next year that I’m thrilled about, and that is more f/f romances than I have ever seen through a publishing year. 2019 queer releases are looking incredible, varied, and full of stories and representation that I know my audience has been searching for. I have also been excited about what seems to be a growing number of short story collections and novellas. The changing landscape for format is really thrilling to me, and I am eager to see how that changes the types of stories we are seeing published. Which BookTubers do you watch? There are so many, oh wow. 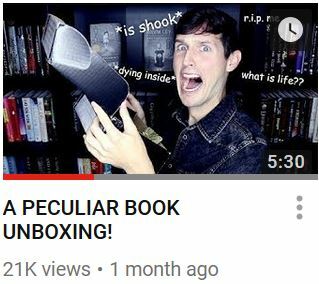 I think Adriana from perpetualpages is and has been doing incredible things with their channel. They are thoughtful and critical in equal measure, and always discuss books I was previously unaware of. BooksandLala has been doing creative stuff with her channel for years, and I think this year has been an amazing leap for her in that creativity. I’m constantly impressed by the content she comes up with. There is Monica from shemightbemonica, who is such an advocate and a positive voice within our community. I love Joseph from The Boy Who Cried Books, Nicole from WoolfsWhistle, Kristin from Super Space Chick, Joce from squibblesreads, and Marines from mynameismarines. I think they all do creative and fascinating things to promote books, and there is so much work and care put into all of their content. Follow Cece on YouTube, Goodreads, Twitter, and Instagram. 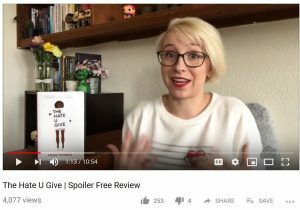 Learn more about Booktube here and subscribe to NetGalley Insights so that you never miss a post.